Bechstein’s bat, Myotis bechsteinii is a European tree-dwelling bat species, which is considered an index species for old growth broad-leaved woodland in Central and Western Europe. However, factors affecting repartition, density and habitat selection are still poorly understood. 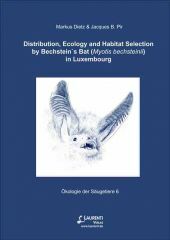 Therefore 22 representative woodland areas in Luxembourg, a country located in the central geographic range of Myotis bechsteinii, were investigated concerning Bechstein’s bat´s abundance and habitat selection – including roosting and foraging behaviour. With the help of mist-netting and radio-tracking for the first time reproduction areas and nursery colonies were localised. The distribution of Bechstein’s bat was revealed to be uneven and was significantly positively correlated to ambient factors and the forest types. Nursery colonies use a day-roost complex of up to 50 trees and show a significant preference for woodpecker holes in oak trees. Bechstein’s bats foraged in small core feeding areas, all of which show no or negligible overlap with each other. Roosting ecology factors such as roost choice versus roost availability, roost switching behaviour, microclimate of roosting sites and basal metabolic rate could be analysed on a free living population under natural conditions. Roosting and feeding sites are here characterised by canopy and understorey structures similar to native woodlands. The results of this study lead to a scientific data base for conservation and long-term monitoring of this bat species. These results should also lead to a positive outcome on sustainable forest management practice for the future conservation of this endangered bat species. 2007, 191 Seiten mit zahlr. Abb. und Tab. 2006, 103 S., mit zahlr. Abb. und Tab. 2005, 120 S. mit zahlr. Abb. und Tab.